Click the images below to view full projects. 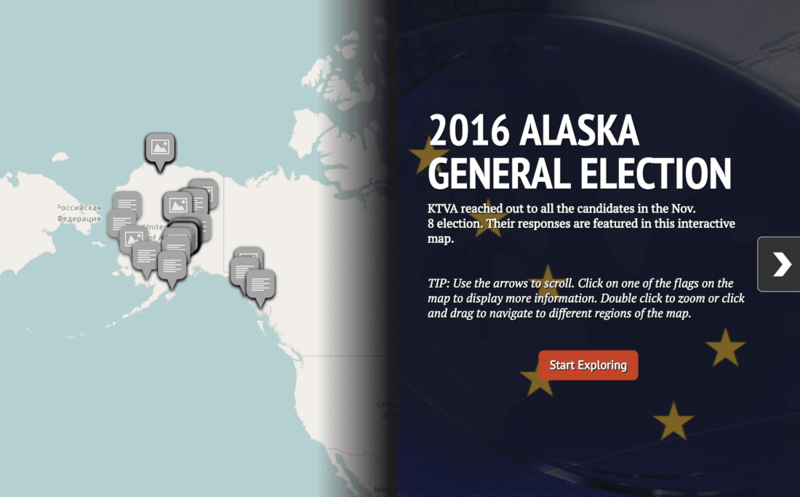 In 2016, I led the web coverage of three elections for KTVA.com. For the primary and general elections, I worked with Kristin Anderson to create interactive maps for voters to get to know the candidates on their ballots. In December 2016, I worked with Frontiers -- a broadcast news program on KTVA that explores Alaska’s modern-day frontiers through an economic and native cultural lens -- to create an interactive, multimedia showcase for their six-month coverage of the Hiland Mountain Correctional Center's Lullaby Project. It includes photos, music and a full video of the concert.